Image caption Israeli Prime Minister Benjamin Netanyahu has said the claims against his wife are "absurd"
The wife of Israeli Prime Minister Benjamin Netanyahu has been charged with fraud relating to the alleged misuse of state funds. Sara Netanyahu is charged with misusing 359,000 shekels ($100,000; £77,000) for catering services at the prime minister's official residence. She is also charged with a breach of trust following a police inquiry, the justice ministry says. Mrs Netanyahu has denied any wrongdoing. On Thursday, she was charged along with Ezra Seidoff, a former deputy director general of the prime minister's office. The Jerusalem District Attorney's Office said the decision to indict both Mrs Netanyahu and Mr Seidoff was made "after reviewing all evidence and weighing all circumstances of the case". Last year, Attorney General Avichai Mandelblit announced that he was considering charging Mrs Netanyahu over the allegations following a long-running investigation, which has been the subject of intense speculation in the Israeli media. 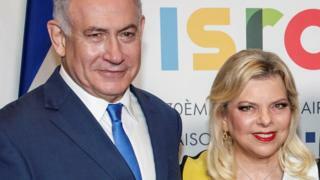 According to the details of the indictment, Mrs Netanyahu and Mr Seidoff are suspected of involvement in expenses claims made between September 2010 and March 2013 for food delivered to the prime minister's official residence and for hiring private chefs. The expenses claims were said to have been made whilst covering up the fact that the residence also employed a cook. State funding for both is not allowed. A statement from the attorney general's office last September said: "In this way, hundreds of meals from restaurants and chefs were fraudulently received in the order of 359,000 shekels." Mr Netanyahu has reacted angrily to what he has long viewed as a witch-hunt against his high-profile family, driven by political opponents. "Sara Netanyahu is a strong and honourable woman and there has never been any fault in her actions," a statement on the prime minister's Facebook page said. Mrs Netanyahu's lawyers said there was no fraud or breach of trust, and she had not been aware of the procedures. The person who ordered the food and trays was the former household manager, now the state's witness, they added.